Super compact. Lightweight. The battery life to easily last even the longest shooting day. Integrating the most advanced timecode and sync options on the market. At a pricepoint that makes it a cost-effective, multicamera solution. We heard you loud and clear. Introducing UltraSync ONE – everything you ever wanted from a sync solution. And more. 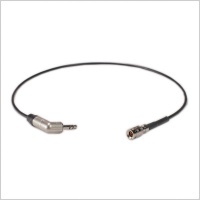 There is no comparable product on the market that can compete with this value for money. 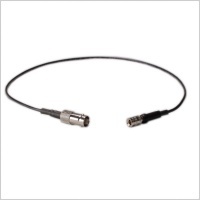 Everything you ever wanted from a sync solution. And more. 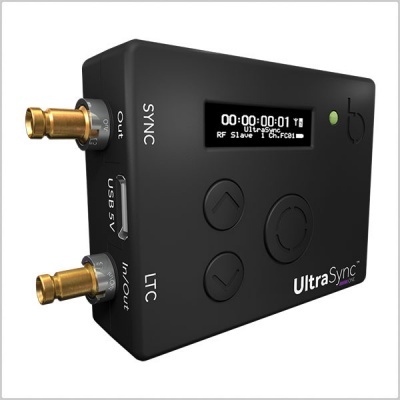 Our goal with UltraSync ONE was ambitious: inject the full power of our timecode, genlock, word clock and RF technology into the most compact sync product on the market. All at a pricepoint that makes it the only sensible option and the de facto option in a multicamera environment. 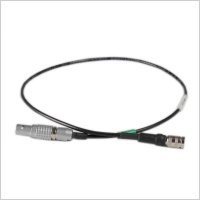 That meant re-engineering every element to make UltraSync ONE not only smaller, but also superior to any other timecode solution on the market. And now, with at least 25 hours of battery life from a single charge, UltraSync ONE has the power to keep going, whatever twists and turns a shoot takes. The power of 25 hour battery life. We’ve revved up the power of the UltraSync to give you 25 hours battery life from a single charge. That’s with RF, genlock and the OLED display all running at full capacity. So no matter how you use UltraSync ONE, you’re guaranteed that your battery will last a full shooting day. And even with all this extra power, it’s still unbelievably thin and light. Our full sync power. Miniaturized. 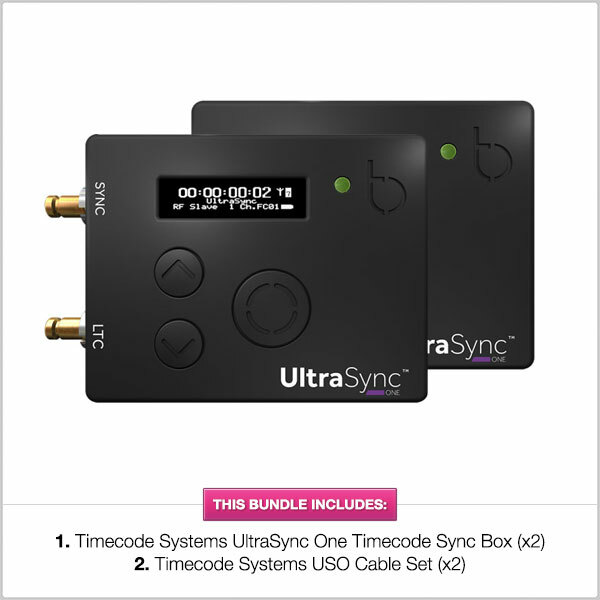 UltraSync might be small but it delivers the complete Timecode Systems sync experience: timecode, genlock and word clock all in one product. And not just any genlock; the most accurate genlock on the market. It can even sync to sensor level for VR. 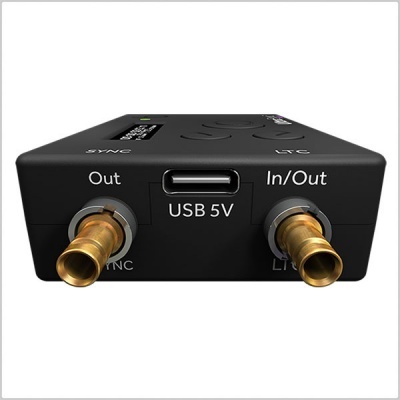 Using BLINK RF to create the sync not only makes UltraSync the most reliable solution out there, it also includes the added ability to monitor and control units using the BLINK Hub app (you’ll just need to add a :pulse or a :wave to your system to make the connection). UltraSync ONE introduces a whole new level of portability, versatility and control to wireless synchronisation. Compact proportions, a 128 x 32 high resolution OLED display, professional locking miniature COAX connectors for timecode IN/OUT and Genlock OUT, a USB C Connector for firmware updates and battery charging, and cleverly concealed Internal diversity antennas – these are just a few examples of how ease of use was just as important as being aesthetically pleasing when it came to the product’s design. Looking for multicamera sync with timecode and genlock outputs? A solution for your VR rig? Or maybe you’re using DSLRs? UltraSync ONE can be used in all these scenarios. And more. 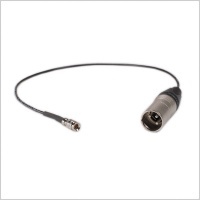 In fact the same UltraSync ONE can be used one day using the audio timecode output of a DSLR, the next on a main camera on in the studio and then later as part of a VR rig. It’s the most versatile solution available. 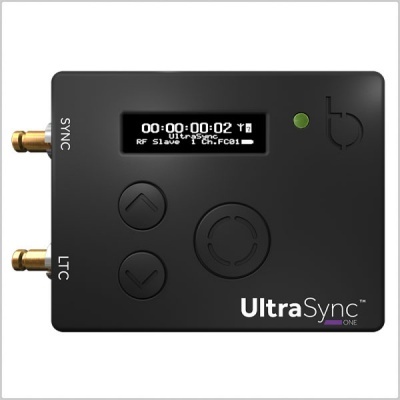 Configure UltraSync ONE as a timecode master, timecode slave or timecode LTC slave. It’s up to you. 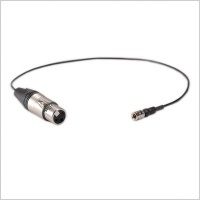 Or alternatively jam to house timecode or an OB truck. And the UltraSync experience is just as amazing whether you’re syncing multiple units with each other or combining them into a BLINK network with cameras and sound equipment using :pulse, :wave and SyncBac PRO units for timecode. 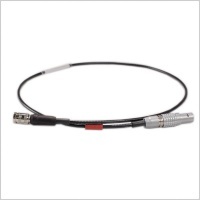 And this is down to using uncongested sub GHz frequency bands for a completely reliable synchronisation with a range of 200m. Everything you need to start using UltraSync ONE fresh out of the box.